Hear a presentation about cool Seattle parks you didn't know existed and get refreshments and a BIG discount on new outdoor gear and clothing! Fjallraven, a new outdoor clothing and gear brand in the Northwest, and Canoe Ridge Vineyard, a Seattle-based winery, are anxious to meet Mountaineers, show you what they offer, and give you a big discount - all while you learn about Seattle parks that you've probably never heard of. Join us September 14 at 6:30pm at Fjallraven’s Seattle retail store to and hear Linnea Westerlind, author of the new book, Discovering Seattle Parks, from Mountaineers Books. 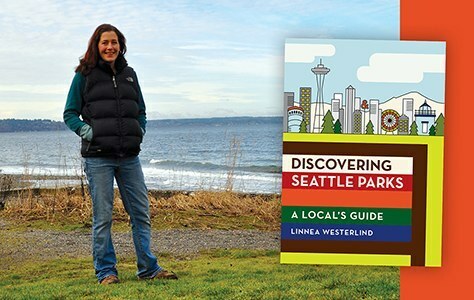 Books critics, families, and park lovers are loving Linnea Westerlind’s new book Discovering Seattle Parks. That's why Fjallraven has teamed up with The Mountaineers to host Linnea at their downtown Seattle store. You’ll hear about parks Linnea likes most, thinks are hidden gems, and which ones will quickly become your favorites. Canoe Ridge will serve its delectables and Fjallraven will show you what mountaineers are using on the trails and peaks of their home country, Sweden. You'll receive a 30% discount off those items you’ll want to take home.